A warranty deed is a customary form for the conveyance of real estate in Louisiana. Deeds in this state may be referred to as Acts of Sales or Cash Sales. The Louisiana Statutes do not provide a statutory form for a warranty deed. In Louisiana, the warranty for condition is referred to as redhibition. Redhibition is a civil action against the seller of a defective product or property, similar to lemon laws in other states. In a warranty deed, the grantor warrants the buyer against redhibitory defects or vices in the property. A redhibitory defect is defined as a defect that renders the property useless, or its use would be so inconvenient that it is presumed that the buyer would not have purchased the real estate had he known about the defects (CC 2520). In addition, the grantor also warrants to the buyer the ownership and peaceful possession of the property, and the absence of hidden defects. The seller also warrants that the property being sold is fit for its intended use (CC 2475). In Louisiana, a seller of real estate who is in good faith is allowed to limit the warranties made in regard to redhibitory defects by including a waiver of redhibition clause in the deed. The grantor to a warranty deed must sign the instrument and have his or her signature acknowledged. Some recording clerks will require the signature to be in authentic form, which although not a statutory requirement is nonetheless a common practice in Louisiana. An instrument in authentic form requires the signature of each party who executed the instrument. 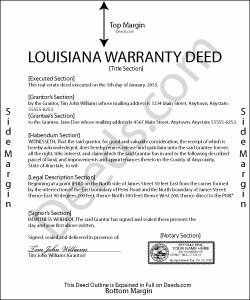 A warranty deed may be acknowledged in Louisiana or out-of-state. If executed out of state, a warranty deed will have the same force and effect as if executed by or before a notary public in Louisiana (RS 35:5). There are three different types of written instruments in Louisiana: the authentic act, the act under private signature duly acknowledged, and the act under private signature or writing. The authentic act is used for most warranty deeds and recorded documents. An authentic act is executed in writing before a notary public, in the presence of two witnesses, and signed by each party who executed the warranty deed or other instrument. Both the witnesses and notary public must sign. The act under private signature duly acknowledged is a written instrument signed before a notary public. The presence of witnesses is not required for the signing of this type of document; however, witnesses need to be present when the notary signs. The act under private signature is not used often. Real estate deeds or Acts of Sale are recorded in the parish at the clerk of courts office in the parish where the real property (immovable) is located. The ownership of real property is voluntarily transferred by a deed (contract) between the owner and the transferee that purports to transfer the ownership of the property. The transfer of ownership takes place between the parties by the effect of the agreement and is not effective against third persons until the warranty deed (or Act of Sale) is filed for registry in the conveyance records of the parish where the real property is located (CC 517). This type of recording act is known as a race statute. Priority of documents is determined by the order of filing. Tom L. said: An excellent service that I would be happy to use again. Debra W. said: I found this site a must. It provided all the forms I needed to file a Quit Claim Deed. I filed what use to be called a Quick Claim Deed 30 years ago. You only had to file the one form. Today it is called a Quit Claim Deed. The pack provided forms that I had no idea had to be filed with the Quit Claim Deed. I would not have known this otherwise if the option hadn't presented itself. Thank you! Reply from Staff: Thanks for taking the time to leave your feedback Debra, we really appreciate it. Christine R. said: Ordering and directions were easy. The only thing missing in the instructions was how to record by mail. Thanks! Reply from Staff: Thank you Christine. We'll work on making it more clear that one can find mailing information in our recording section. Have a great day!